25th APRIL 1915. ROSYTH: ‘A LITTLE FLEET OF WAR BOATS ON THE FORTH’. April 25th Sun Working parties on G.H.Q line, three reliefs of 200 each during the day. GODMOTHER MARY FOSTER: LETTER to Lance Corpl. SYDNEY HIBBETT & Pte BERTIE HIBBETT (included in Bertie’s 1st May letter Home with a pencil note at the top:- ‘Let Mother read this. Don’t forget. I should like you to send her an Observer now & again’. He has underlined ‘Dear Boys’ and the first & last sentence). Do you know I am getting very anxious about you. I know it cannot always be easy for you to write & so I just hope that is the only reason. I was greatly interested in your last letter in spite of the little news you are able to give us. I was thinking about you in the Trenches at Easter & wondering where you are now. You cannot tell from your surroundings that it is Easter in Scotland, everybody goes to business as usual. We went to the Soldiers’ Service in Dumfermline Abbey at 9.30, but we had not even an Easter hymn. The singing of so many men was very impressive & the kilts look very picturesque. (1) Naval Base at Rosyth was still in building: the first WW1 ship to be repaired there was the pre-dreadnought battleship HMS Zealandia on 28th March 1916. NEXT POST: 1st May 1915. Letter to Basil Hibbett on his 17th Birthday. 1915 Easter in Scotland.Good Friday in Scotland 1915.HMS Zealandia.Naval Base Rosyth 1915.Soldiers' service Dumfermiline Abbey 1915. 24th APRIL 1915. WULVERGHEM: BOMBS, BULLETS & BISCUITS. April 24th Sat. Drill – Route March. Working Party of 200 men on G.H.Q. Line, 8 -12 midnight. 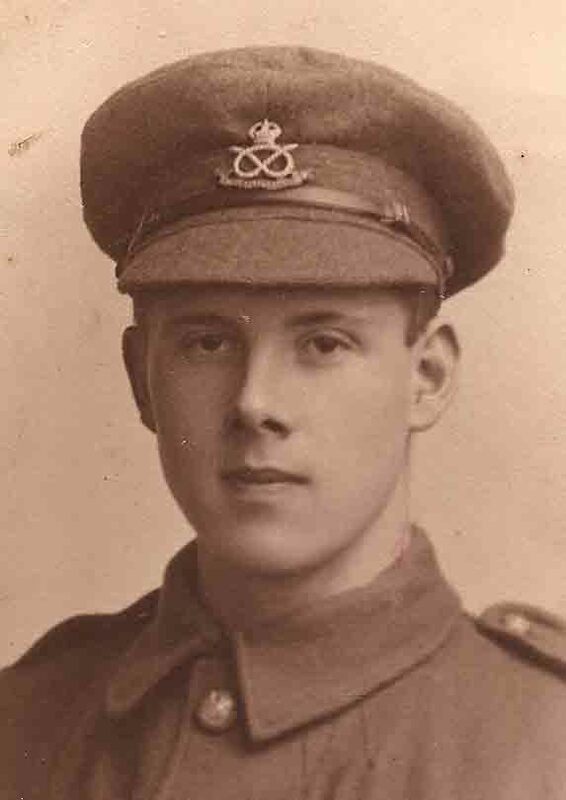 21st Birthday 17th May 1915.. I am taking this, the first opportunity to answer your last two letters to me. Many thanks for your interesting chat and also for your good opinion of our doings. It cheers one up & eggs one on to know that you are all thinking & praying for us when you have time. I was very glad Harold got my letter & ‘love’ & that you saw it. Ask him if he got my instructions about Eddie & George not touching my Velox motor as it is important (3) & (4). I received (also Bert) your letter yesterday; the post always arrives about tea-time here at the Rest Camp. I was glad to hear from the Overend girls & I sent Winnie a Field PC by return, thanking her for the chocolate, or rather acknowledging the receipt of same & her letter you enclosed. It is very nice to know these people think of you. As for courage & determination, I don’t think we remember that when they are shelling us, as I described to you before. If you are on sentry you have to still look over the parapet or through the loophole, as a matter of course, just to see if the beggars are watching the shells burst & then of course you take a sight on the blighter & perhaps over he goes – & there’s another for Whitby Abbey! (5). The Lyddite are the worst shells as the fumes make your eyes smart so that you cannot see properly (6). Our partner ‘E’ Coy. was shelled again on Wednesday & though not a man was hurt their dugouts & parapets were thrown down & in an awful mess. Several shells did not burst – there was a distant boom, a swish overhead, bump, but no explosion. Very funny to see the chaps’ faces when it didn’t burst. Well we came out of the trenches for the 3rd time on Thursday night at the usual hour when you would be asleep in bed. What would happen if all of us went to sleep then? My platoon has not been in the trenches this time. When the Batt. went in last Sunday night we stopped at a farm in the rear which was our billet for the time (6). We slept in a barn & though bullets at times flattened themselves on the walls & in the yard we managed to keep clear of them, except for one or two who were hit in the arm & head. They are bullets that don’t strike the trenches’ parapets, but flying over continue until they descend in the farm which is close to a very much shattered village (7). This village (about as big as Uffington (8) would be very pretty in peace time & especially now in the Spring but Good Lord! it is now a disorderly heap of bricks & wood. Every house is shattered, the church has one wall of the tower left, the clock remains at 6.10, the windows are broken & bent beams lie all around; graves have disappeared & only a great hole remains. The chairs inside are matchwood. The Catholic Priest’s house opposite was a very beautiful residence once, but all his pictures & library & household effects are littered about – valuable theological books are there – still whole, but neglected & dusty. Then his garden is still beautiful with flowers and shrubs but littered with biscuits (9) & refuse. In short a ghastly mess. Sunday 6.pm. We have been building up the parapets in our reserve trenches from 10 am till 3 pm & so I am rather tired. The Germans sent some shells over us which exploded near the village. The holes could be seen & the earth & stuff went skying up. We were all digging hard, about the time you would be having dinner, when suddenly we heard the swish of the first shell coming over – down we all jumped into the trench & crouched thinking we were their blessed objective – but it passed over & I was just in time to see the shell burst near the village a few hundred yards away. Well we had it like this for about half an hour, our Territorial battery replying & then it ceased. It has been very warm today – the artillery of both sides, especially our own, has been very busy lately & today also. We could see the gun flashes & hear the blessed shells. I received a nice writing pad & material from Miss Negus (10) today & also a lovely box of chocolates & parkin from Auntie Pat* yesterday – nothing is left now! They had Church parade while we were away digging, so I have read the Psalm over for today myself (11). (1) Bruce Bairnsfather. Bullets & Billets. 1916. Chapter XXIII has a similar but more detailed description of the state of the Wulverghem Church & Priest’s House, 1915. The Project Gutenberg ebook produced by Jonathan Ingram, Steven desJardin & Distributer Proofreader. (2) Himley Hall, Dudley, Staffordshire: Home of the Lords of Dudley* (since 16th Cent. Owners of coal and iron mines) – playful contrast with Sydney Hibbett’s present billet! (3) Eddie & George – possibly young Hibbett cousins in Yorkshire. (4) Sydney Hibbett’s Velox was one of only 21 automobiles made by Velox Motor Company of Coventry (established 1902. Directors: George H. Davie & A.F. Harris). Grace’s Industrial History Guide. (4) Whitby – 16th Dec. 1914 suffered 7 minute German bombardment from sea, . Abbey seriously damaged. (5) Lyddite is picric acid (Greek for ‘bitter’ reflecting taste/smell): formerly called ( TNP) 2,4,6 trinitrophenol – primarily an explosive, also used in medicine/anaesthetic. Lyddite Shells were high explosive shells, capable of piercing armour, used in Boer War & WW1. Common Lyddite shells detonated/ fragmented into small pieces in all directions (but no fire). 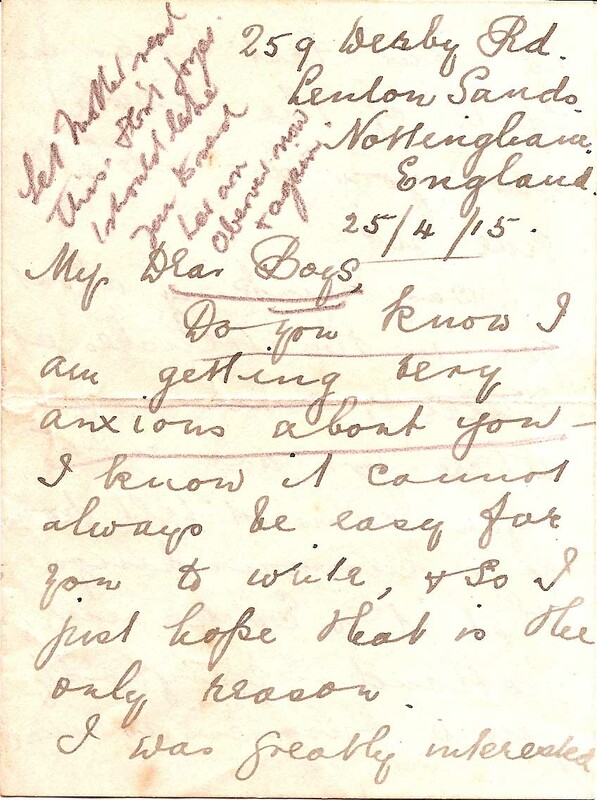 See Pte Bertie Hibbett’s letter of 23rd April, 1915. (6) Souvenir Farm/ Ration Farm? (7 ) Wulverghem. (8) Uffington in Lincolnshire (2 miles east of Stamford, i.e. close to Rutland – early 19th century home of Hibbett family). (9) Biscuits. It occurs to me (brought up in a Vicarage) that these could be large unconsecrated Priest’s wafers ready for the Mass – even if a more humble biscuit they create a poignant image. (10) Miss Negus (unable to trace). (11) Psalm for 24th day of month: Ps.116 -119. Book of Common Prayer, 1662. (12) Bertie Hibbett’s April letters make no mention of his sore feet (no doubt to allay his Mother’s anxiety) but to be excused parade is indicative of ‘something to worry about‘. NEXT POST: 25th APRIL 1915. Letter from Godmother Mary Foster, Fernleigh, Nottingham. Bruce Bairn'sfather.Food ParcelsHellfire Corner.Himley HallLyddite shells.Mass/ Communion wafer biscuits.North Staffordshire Regiment.Picric acid.Psalms.Souvenir Farm/Ration FarmTrench Digging & Repairin.Uffington.Velox Motor CompanyWhitby Abbey.Wulverghem Priest's House. 23rd APRIL 1915. 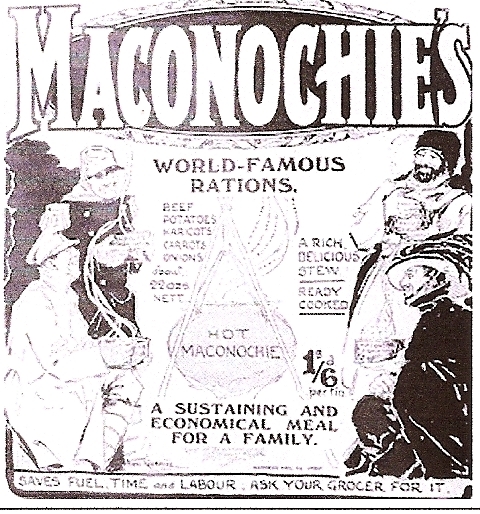 WULVERGHEM: ‘EXCITING TIME’ RATION FATIGUE & GAS ALERT! NEUVE EGLISE. April 18th. Sun. Practice in crossing barbed wire entanglements. Bn paraded for Trenches 7.20 pm. Casualties. Wounded: 8948 Pte C. Weaver, ‘C’ Coy wounded during relief. 83 02 Pte L. Benton ‘B’ Coy wounded while carrying rations. Now possible to visit all Trenches by daylight. April 19th Mon. WULVERGHEM Trenches. Fired on German working party opposite 10b trench. Outburst of rapid fire from German trenches about 3.30 a.m. Two H.E. followed by two shrapnel fired at S.P.4 at 6.0 am. No damage. Casualty: 9468 Pte J.T. Stanley ‘C’ Coy wounded. April 20th Tue. Six rounds shrapnel fired by German artillery at 120a left. No casualties. Trenches 8 (Bertie’s) & 9 troubled by German sniping from MESSINES..
April 21st Wed. Further sniping along 8 & 9 trenches. Casualties: 9199 Pte A. Walker; 8817 Pte R.W. Hempshall, both ‘A’ Coy, wounded. Two HE shells & two shrapnel burst near & over SOUVENIR FARM about 1 pm. Casualty: Major J. Lees wounded. 6 H.E. shells fell in Wulverghem about 1.30 pm. 16 H.E. shells burst in & near Trench 9, doing much damage to parapet of 9b. Working parties brought in & fire 10 rounds) opened on German Trenches at 10.30 pm. Casualty: Pte Hounslow ‘D’ Coy wounded (died later). April 23rd Fri. NEUVE EGLISE. Bath & cleaning up. Working party of 200 men on G.H.Q. line. 8 – 12 midnight. PTE BERTIE HIBBETT LETTER to sister IDA HIBBETT, 95, Foden Rd. Walsall. Friday April 23/ 15 (White envelope, Post Date 27th). A simple address – I won’t say dearest or dear dear or very dear and couldn’t say darling! Yet I guess that Sid and I love our only sister with infinite love & I find it difficult sometimes to keep it from sentiment, for we seem to love one another more when we are apart than when we are together at home, what say you? – yet again I guess you often wish us to be at home again. The censor is growing stricter. I am afraid of letting you know in detail the exciting time we have had this week. We have not spent our time in the trenches but have been on fatigue carrying rations & other things to the trenches, making about 3 journeys each night. Pretty exciting. (2) Well I must keep this letter quite free from officialism. The more you say or think your letters not good enough the more we like them. Your last letters we received today are simply ripping and so homely and above all the letter from E. Overend* brings back old 106 New Rowley Rd Days (3). The PICKWICK CLUB of 1905: scribbled note amongst Pte Bertie Hibbett’s Letters. Sam Pickwick President – I. Hibbett. Augs. 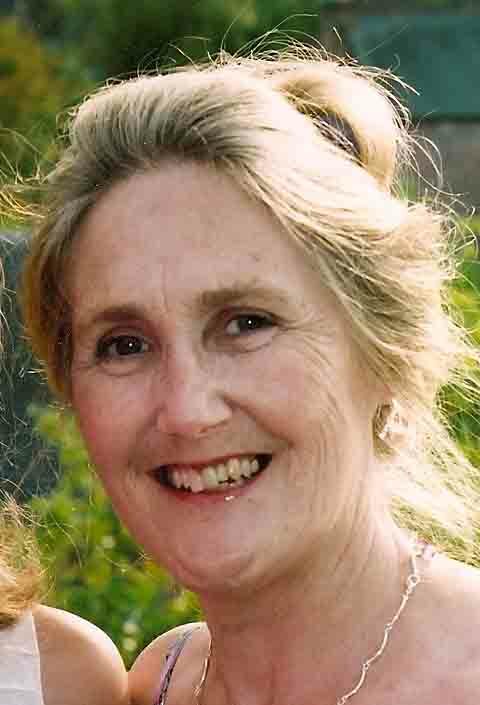 Snodgrass Member – S. Hibbett. (8 yrs). Sam Weller Member – M. Overend*. Tracy Tupman Member – Bertie Hibbett (7 yrs). Sam Wardle Member – I. Cozens(?). Nath Winkle Member – D. Cozens(?). Has Dodger come back from his holidays yet? – if not he is thoroughly enjoying himself? Did all your ears burn ? I mean those of Mother, Dad’s as well as yours, on Monday teatime? – because you can picture us in a ruined farmyard eating with enjoyment the sardines, butter & finishing off Mother’s currant bread. Tell Mother the bread kept lovely & light, not dry in the least. We get tins of butter now & again, but we preferred the butter from home with the currant loaf. Don’t forget to try & send us one or two different photos of the family, especially a good one of Mother. I have not one of Mother close to. I hope Harold will get settled well at Bedale (6) rather a long way from Mother. He will make a third one away won’t he? Miss Foster would be greatly interested in what and where we are, so could you send her a Walsall paper now and again giving her a description of our experiences? as I dare not say much in these letters. You can tell the Overends* we QMS (7) boys manage to keep together most times. Lucky isn’t it? I will finish this in the candle light. Sid and I received a parcel of chocolates and parkin from Auntie* (8), so have you written to York then? I could do with another towel. Best love, Bertie. Sid will tell you of the queer coincidences with regard to a parcel from good Mrs Penning*. (1) ‘Fumes of asphyxiating gas’: April 22nd 1915 marked the first use of POISON GAS by the Germans on unprotected French troops at Ypres. Until I read Simon Jones‘ article in the Guardian (for 22nd April) that the smell of chlorine gas spread for ‘miles around’, I thought this 1/5th S. Staffs War Diary reference was to the fumes caused by exploding Lyddite shells (see Sydney Hibbett’s letter to his sister, 24th April 1915). Wulverghem is less than 8 miles from Ypres and the order to be ready to ’embus’ at short notice could well indicate poison gas alert. 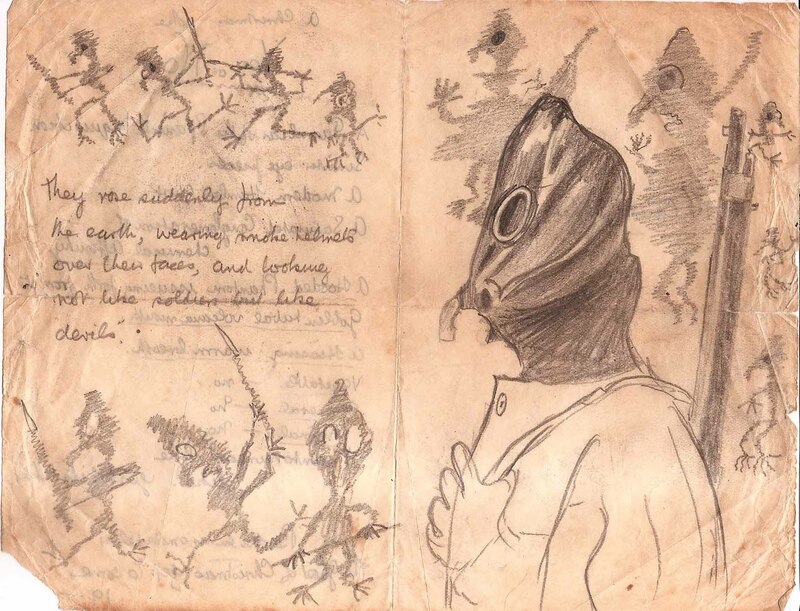 My father’s drawing ‘A Christmas Ghost’ is included in his Christmas Letters of December 1915 – as if he had only just been issued with a ‘smoke helmet‘. 2) Ration fatigues had to be made at night because of the danger from snipers. Ration Farm, (La Plus Douve) half a mile east of Wulverghem, south of road to Messines (Mesen) was most probably where Bertie met up with his brother after his absence in March. (3) 106 New Rowley Rd, Walsall; where Hibbett family first lived in Walsall, before moving opposite to 95, Foden Rd. (4) The Pickwick Club seems to have been formed by Ida & Mollie or May Overend for adventures and to share observations – vis a vis Dickens’ novel Pickwick Papers. (More to come in 1916 Letters Home). (5)Nil Desperandum – Never despair! (6) Bedale, Yorkshire; Harold’s new post as Shop Manager, retail Chemist (cf.1911 Census). (7) QMS i.e. Queen Mary’s Grammar School, Walsall. (8) Auntie Pattie (Pat) Yoxall/Neal? unable to trace on family tree/ possibly lived in north Manchester. (8) Lieut Tim Cozens* see S. Staffs War Diary above 22nd April 1915. Also Walsall Observer for April 1915. NEXT POST: 24th April, 1915. Wulverghem Village: bombs, bullets & biscuits. 17th APRIL, 1915: WULVERGHEM VILLAGE SHELLED & Trench 8. April 9th Fri. Inspection of ‘B’ & ‘C’ Coys by Brigadier. Working Parties. April 10th. Sat Bn paraded at 6.30 pm for trenches to relieve 1/6th S Stafford Regt. Relief completed 11.0 pm. Casuality: 9414 Pte D. Jones ‘C’ Coy wounded during relief. Trench Parade 6.30. April 11th. Sun. Wulverghem Trenches. Quiet day. Captive balloon up from Messines. English aeroplane over hostile trenches received from trench garrisons. Officers’ patrols examined cross sap Trench 8 (Bertie’s) (1) to Trench 10a & worked up to German wire. Casualities: Killed: 8346 Pte W. Durrant (M.G. Section) 114 Pte H.J. Rock both ‘C’ Coy. shot thro’ head. Wounded 9466 Pte A. Tortoishell ‘D’ Coy. April 12th Mon. Working Party in Trench 8 (Bertie’s) under heavy fire about 2.00 am. 10a & 10b Support & Wulverghem village shelled between 4 – 6 pm. No damage. heavy transport heard moving at back of German lines about 9.30 pm. Officers’ patrols again examined cross sap & reconnoitred German Listening Post. Casualities: Killed 6943 Cpl G. Howard ‘D’ Coy Wounded: 9068 Pte W. Smith ‘A’ Coy. April 13th. Tue. Five H.E shells dropped into Trench 9c. about 12.15 pm. Casualties: Wounded: 9088 Pte G.H. Benton seriously wounded (died same night). 8070 Pte R. Bradley ‘A’ Coy wounded. Two men buried in collapse of dugout, not hurt. Trench 10b shelled between 3-4 pm. No damage. Burst of rapid fire from German lines between 8 &11 pm. April 14th.Wed. A few shells fell N of Wulverghem about 1.0 pm. Casuality: 8906 Pte W. Hough ‘C’ Coy wounded. Relieved by 1/6th S Staffs. Relief complete 11.0 pm. Marched to ‘Bulford Camp’. April 15th. Thur, & 16th Fri. Neuve Eglise. Drill. Kit Inspection. Working Parties. Musketry on 30x range for indifferent shots. April 17 Sat. Baths all day. 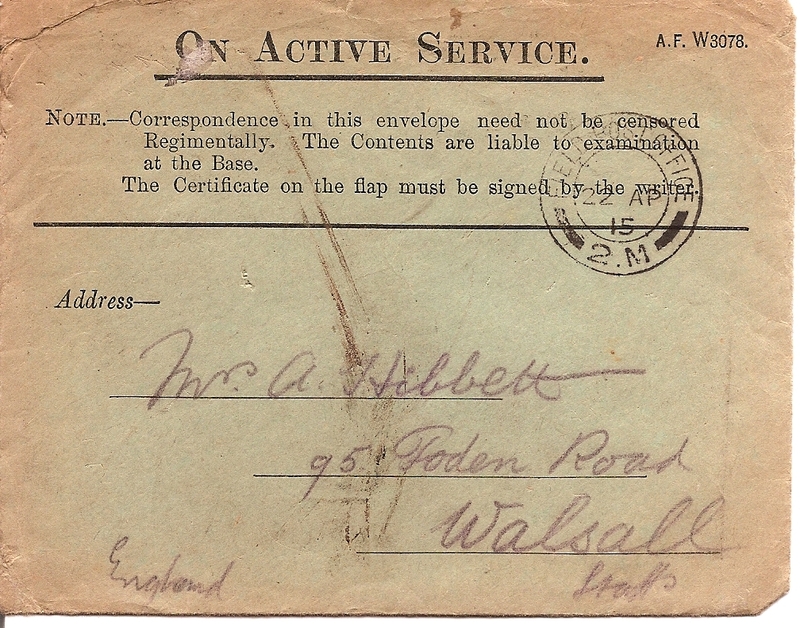 Pte BERTIE HIBBETT to Mother, 95, Foden Rd, Walsall, Staffordshire, England. (last page missing. Envelope post marked 22nd April 1915). We have not long had dinner; we shall enjoy the currant bread & butter for tea & will write later saying how we appreciated the cafe-au-lait. I guess we shall be in the trenches again before we finish off the contents. Evangeline Holland: Ghosts of WW1 website. Tin Drum Brazier. I believe we go in for the last time at this place, but for six days not 4 as usual. We shall be able to make hot water on the little braziers (3). I can say Mother that I have enjoyed the best breakfast I have had since we’ve been . . . (censored). . . here in the trenches. I can get the bacon nice & hot, & fresh tea all hot, whereas in camp with waiting in the queue the tea is generally cold or lukewarm. Sid and I received a PC each from Garvock Hill (4) where Miss Foster* spent her Easter. You have had bad weather in Walsall, so had she, snow & rain. We also had two lovely postcards of Ashton (5) from Dodger. I guess you remember well the Dingle (6). It looks very pretty from the PC. Basil misses us, I read, yet he says he may as well enjoy himself as much as possible while he is about it. Quite so. Please don’t be too anxious, dear Mother. We shall treasure and appreciate the glorious home-coming still more if we take things patiently. What did you think of my letters ? – not morbid are they? Ida’s letters were read with homely pleasure (if there’s such a phrase). I got such a ‘nice’ letter too from Miss Brookes* at Southport. Mr Brookes* seems rather interested in my letters too. I shall have to take great care over my grammar & let Sid write oftener. We went to another bath this morning. I must apologise for not letting you know we do get paid. We were paid 5 francs yesterday (7). Sid had 10 francs because of his being away about the time when you sent your last but one parcel. So you must not send anymore. We do not know how to express our gratefulness. You were very good in remembering the Emery cloth which is of good quality too. I have your photos yet. Could Harold send us some more? – one of us taken from the inside of the tent at Abergele? Sorry to hear you had an unpleasant Easter Day & hope you will soon be better. Do you get a letter or PC from us each week? What do you think of this envelope? (8). I sent a letter to Tom Ser (9) thanking them for some chocolate – got while we were on sentry in the trenches. This Nestles of yours is lovely. Sid can’t go without a bit. PS Could you send some thicker & white note as this lead (pencil) does not show so plainly. Pte BERTIE HIBBETT: LETTER to FATHER, Educational Offices Lichfield St, Walsall. Sidney and I have written this afternoon to Mother thanking you all for another parcel of good things. Sorry we did not inform you that we do receive pay, – about once a fortnight. So Mother must not send any more, although the cash will come in useful in the way of getting vegetables if there is any knocking about. PS: I could do with a Seidlitz Powder (12 ) in your next parcel. (4) Garvock Hill, Dumfermline, Fife. (5) Ashton-under-lyne, Tameside, Greater Manchester (Family Home of Marie Neal (Yoxall) Hibbett. Bertie Hibbett’s cousins the ‘Ashton Boys’ volunteered in 1914, see Aug.1914 letters). (6)The Dingle: area in Ashton, possibly Yoxall family home. (7) French/ Belgium Franc: 25 to pound sterling in 1915. So Pte Bertie received less than £5 a fortnight. (When France left gold standard in WW1 the franc lost 70% in value. See website Old Sweats). 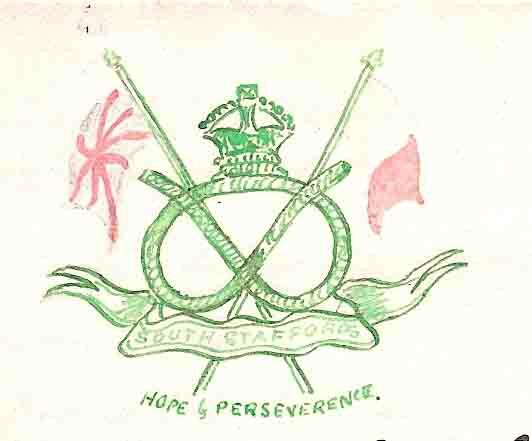 (8) Green Envelope: Pte Bertie’s first use of new official envelope/Army’s attempt to speed up censorship of 1,000s of letters sent home in 1915. Soldier signed on back: I certify on my honour that the contents of this envelope refer to nothing but private and family matters. (9) Tom Ser: Hibbett family, possibly Bertie Hibbett’s uncle; lived at Uffington, Rutland. (10) Henning/Hemming: Arthur Hibbett’s Secretary at Education Office, Walsall. (11) Walsall Municipal Science & Art Institute. (12) Seidlitz Powder: effervescent salts (bicarbonate of soda, Rochelle salt & tartaric acid) to aid digestion or as a laxative. NEXT POST: 23rd April, 1915. 1915 Franc value.H E Shells.Maconochie.Nestle's chocolate 1915.Seidlitz Powder.South Staffs CasualtiesTrench BraziersWulverghem Village shelled.WW1 Green Envelopes.WW1 Parcel Food from Home. 8th APRIL 1915. NEUVE EGLISE: EASTER JOY, A BATH & AN EGG! APRIL 7th. Wed: Neuve Eglise. ‘A’ Coy inspected at 3.0 pm by Brigadier. Working Parties sent to trenches. Baths provided for men. APRIL 8th Thur: Short route march. 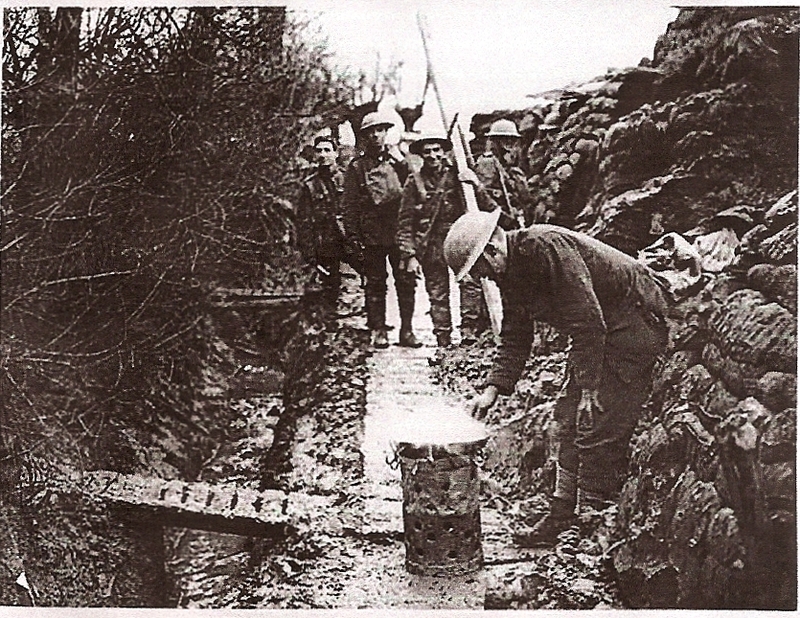 Working Parties in trenches. Baths. Refitting. PTE BERTIE HIBBETT: LETTER to MOTHER, 95, Foden Rd. Walsall. You will be very pleased to know that I (at least) have had a very very happy day. We had the opportunity of attending not only a Church Parade, but Holy Communion afterwards. Sydney and myself went & there were several others I knew. To add to my happiness Sid and I received your very welcome interesting & jolly ripping letters. I appreciated Dad’s especially. I think Mother that the little sermon we had on Good Friday about struggling a necessity to gain the cross has come true on a smaller scale for the weather was wet in the trenches & circumstances not at all ‘pleasant’ but this afternoon has turned out bright and sunny & the evening sun shone in the little hut where Holy Communion was administered by our Chaplain. Again all seemed queer to see each soldier in skeleton equipment form up in line to receive the Holy Eucharist. Sid is writing. He told me on the little route march we had this afternoon that he had not written often, but he had no means at all & was not allowed to write & send correspondence during his time away. I read about Harold and hope like Father that he will get the post & stick there, yet he will be far from home won’t he? Mother, your parcel of underclothes came just in time luckily. 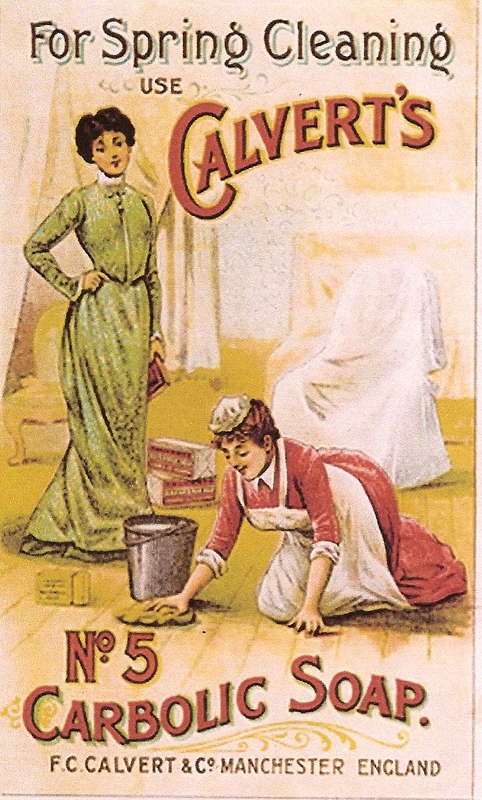 We went to some baths this morning at about 6 am and they came in useful, also the lovely Calvert’s Carbolic soap (3). We are looking forward to the currant bread & could you afford a little, just a little, butter? You will be interested, all of you, that the Colonel praised us for our behaviour in the trenches. We are now out for four days rest & probably going again on Saturday. I am, after finishing this letter, going to boil my Easter Egg. Yes there are hawkers at this camp, eggs can be got at 2d each (4). I will answer the many letters we have received lately in a day or two. But Dad knows well how difficult it is sometimes for us to scratch a line; – you will appreciate the one I wrote in my dugout in the rain! (2) On the Resurrection Morn. 1864. 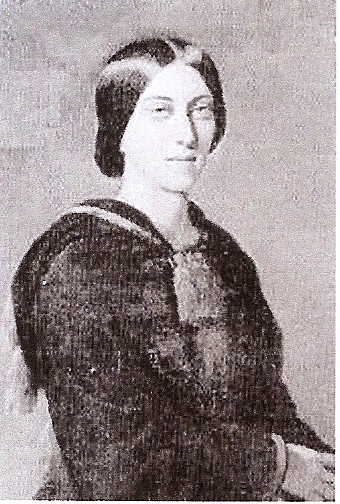 Sabine Baring Gould, 1834 -1924. (Born Exeter, Devon. Anglican priest, married daughter of mill-hand, called her ‘Half my Soul’, 15 children. Author of many popular hymns, including ‘On ward Christian Soldiers’. Interest in archeology, folklore & architecture; designed. Lew House & St Peter’s Church, Lew Trenchard, Devon. See <www.sbgas.org/SBG> (Tune Resurrection Morning. Ira D. Sankey, American Gospel composer, ‘The Sweet Singer of methodism’ associated with Dwight L. Moody). (4) Hawkers/peddlars frequented 1stWW Camps with cheap wares. 2d (pence) – worth 1p today. NEXT POST: 17th April, 1915. April 5th Mon: Sniping frequent all night. Searchlights used on both flanks & our working parties much hampered (1). Damage to breastwork by shell fire made good. 10a trench again shelled in afternoon, also Wulverghem village. 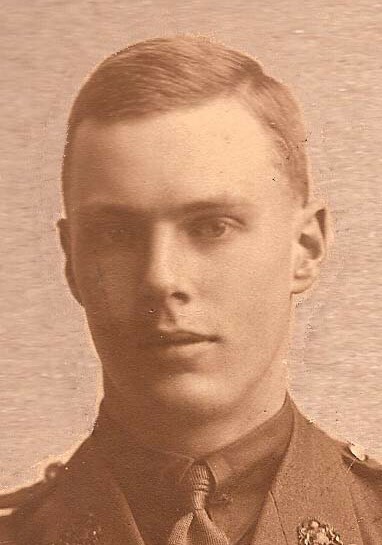 Casualties: 2nd Lieut F. Eglington & 9531 Pte W. Horton ‘B’ Coy wounded by shells. Heavy rain, much water in trenches. Just a few lines to say I met Sydney on the night of Easter Sunday. The meeting came quite as a surprise, little did I know I should see him in such a place. I was one of the ration party making its way late at night over the country (1) ; we halted at some part of the line of trenches for rations & I came suddenly upon Sid. We laughed We shared the remains of the parcel I kept in my valeise (sic) this morning. Sid looks very well. It is raining this afternoon & I am writing this in the dugout. Well I have written to Mr Darling* & acknowledged Mr Hurst’s* parcel in the way of a letter. This is some of the note he sent me. I remember your very kind letter last. Yes the soap was lovely. We have not yet finished the 1st parcel. Sid has some cigs left & there is some cocoa & oxo left. I did not come across the emery paper until later on for it was at the bottom of the box. Many, many thanks for it – greatly indebted to you for it will come in handy now the rain has rusted the bayonet. Hard up for a wash in these trenches. As for a change did you get my letter saying we could do with one change of shirt and pants – & if you like an under-vest. I guess Basil is looking very much forward to his holiday in Manchester, what oh! Tell him to remember us to relatives there and hope he will return home the better for his stay there. I saw a photo of a Captain Sidebottom of the Lancashire regiment reported killed or wounded. A.D. Jones* has promised it me. I hope to send it you later. Perhaps you knew him, I have heard you talk about those people at home. Well I’ll close now. V. Evans* has come back too with Sid. Best love to all. God be with you. Bertie. PS Tell Ida we have been to the 2nd place she mentioned in her letter. (1) Pte Bertie (night ration party) in danger of snipers. (2) Easter Day Collect. Book of Common Prayer. Thomas Cranmer, AD 1662: Almighty God, who through thine only begotten Son Jesus Christ hast overcome death, and opened unto us the gate of everlasting life . . .
Epistle. Colossians 3.1. St Paul, AD 40: If ye then be risen with Christ, seek those things which are above, where Christ sitteth on the right hand of God. Set you affection on things above, not on things on earth. For you are dead. and your life is hid with Christ in God. Gospel. St John 20.1: The first day of the week cometh Mary Magdalene early, when it was yet dark, unto the sepulchre and seett the stone taken away . . . (AD 90 -100). NEXT POST: 8th April, 1915. 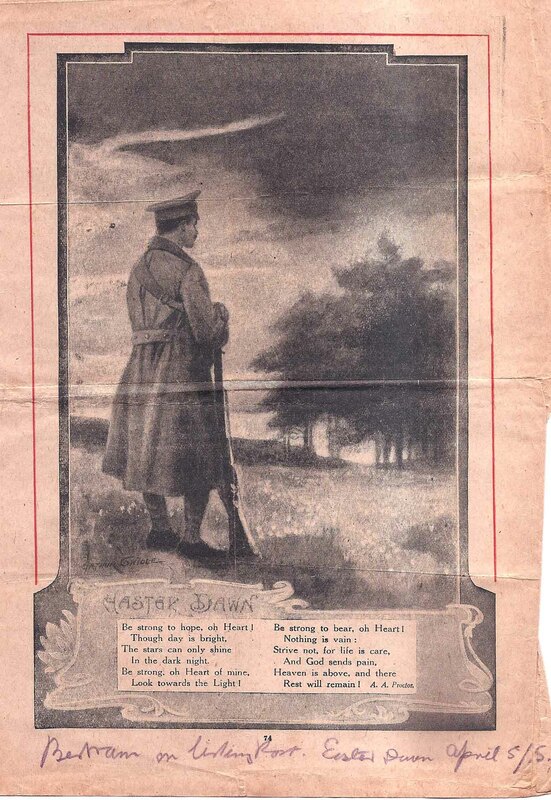 4TH APRIL 1915: EASTER DAWN, WULVERGHEM TRENCHES. Easter Dawn. Home Words, Vol XLV No.4. April 1915. 3rd April 1915: Brigadier Gen. E. Feetham (1) visited trenches of Battn. on taking over command of Staffs Infy Bde. Trenches in considerable disrepair. Gaps between 10a & 10b. Practically impossible to visit them in daylight. V. little wire. Work on improvements & extensions commenced at once. Trenches 10a & 10b subject to enfilade (2) fire from left – & 8 & 9, from right (MESSINES HILL). Casualties: Killed:- 8137 Pte A. Hunt, ‘D’ Coy; 9579 Ptes T. Childs, ‘A’ Coy. Wounded: 9866 Pte G. Derby, ‘A’ Coy; 8765 Pte W. Law ‘B’ Coy. 4th April. (Easter Sunday). At 3.15 pm German Artillery began to shell Trenches 8 & 9 afterwards attacking 10a. Later they shelled Wulverghem village., & set on fire ‘Gable Farm’. At 2.pm just before shelling began a white flag was shown in enemy trench opposite to Trench 8. (Pte Bertie’s). Casualties: Wounded by shell fire:9110 Sgt J. Hayward & 7667 Pte F. Stockholm. Much firing during the evening. 8109 Pte A. Weston, ‘C’ Coy wounded while carrying rations to trenches. Pte BERTIE HIBBETT: A Little Book of Words & Doings. Easter Dawn: ‘with Sam Harvey* on Listening Post at ruined house in front of trenches at Messines. Drizzle & rain chiefly all day. Wrote to Mr. Darling* (3) censored by Lieut Wright*. Remember rain making the blue lead run. Beautiful sunset & fine on close of day. Well Sid went and picked some of those lovely light blue May flowers, the Forget-me-nots, & I thought of the brilliant idea of sending one in my letter to adorn the heading of a real May Day story letter. We are about . . . (censored). . . and we are sorry for we’ve had a lovely time in the . . . (censored). . . trenches. The weather is simply glorious, like June. Picture me on sentry from early dawn, watching the sun rise in all its splendour, then the thrush whistling its morning sacrifice & the lark at heaven’s gate singing. Later in the day I heard the faint call of the cuckoo. There I stood for two hours, standing, watching, waiting under a cloudless sky. I frequently heard the buzz of those birds, the aeroplanes. I would gaze into the sky but could see nothing. . . (censored). . . although he was in the ethereal blue. Sid and I were together in one dug out (and by the by it was the first occasion of [his] taking command). Sid & I tried to make our corners as homely as possible. I gave him half of a number of cigarette cards & he went and got some flowers. Sid you know was fond of bringing you flowers, and added to the decoration of his part, while I rummaged among my letters for some PCs. I had the one of ‘Home’, 95 Foden Road, Harold’s PC of St Paul’s and Sunday S. Scholar’s PC of the Hospital, – all three on a shelf over my head. I placed Basil’s lovely PC of ‘The Dingle’. . .
(1) Brg. Gen Edward Feetham, C.O. Staffs Infantry Brigade. (Killed in Action 29th March 1918. Age 57 yrs. memorial Picquigny Cemetery). (2) enfilade (or flanking attack): fire that can travel the length of a trench or column of soldiers/ medieval tactic used by English yeomanry against French in Hundred Years War 1337 -1453). (3) The Revd. 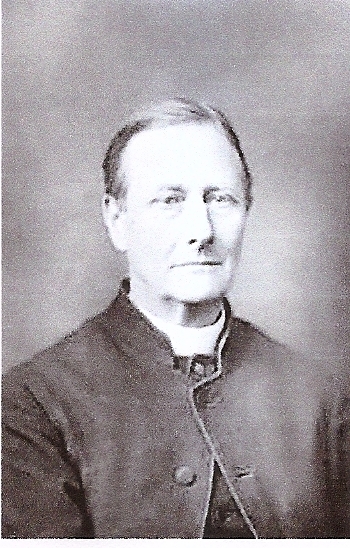 E. More Darling, Vicar of Walsall. Poem: Adelaide Anne Proctor, 1825 -1864. Be strong to hope, oh Heart! Though day is bright, The stars can only shine In the dark night. Be strong oh heart of mine, Look towards the Light! Be strong to bear, oh Heart! Nothing is vain: Strive not for life is care, and God sends pain. Heaven is above, and there Rest will remain! 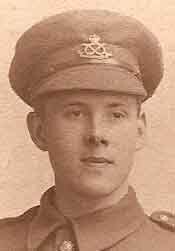 (5) Sydney Hibbett could have been promoted to Lance-Corporal or Corporal in the days he was away. NEXT POST: Easter Day, 5th April 1915.